Venerable Zasep Tulku Rinpoche has taught in the West for 40 years and is spiritual head of Gaden Choling for the West centres in Canada, U.S. and Australia. Is it possible to achieve longevity? And what about karma? Note: If you have initiation, you would visualize as Rinpoche outlines in detail. If you do not have initiation, you can still do the practice and mantra by visualizing White Tara in front of you, facing you, with healing light coming into you — rather than yourself as Tara. H.E. Zasep Rinpoche: I would like to give some instructions and explanation on how to practice White Tara longevity. There are different Tara practices. White Tara practice is for longevity and good health. Question: Is it possible to achieve longevity? And what about karma? Some people ask the question. Maybe it’s already predetermined, how long one could live once a lifespan. Yes, of course. Everything is karma, but that doesn’t mean we cannot practice long-life practice, and it does not mean that long-life practice does not have effect on us. Because when you practice long-life sadhana, long-life mantras like White Tara or Amitayus Buddha, and so forth, you are also creating good karma, or long life, this very moment. So, there’s many different karmas; karmas of the past life, karmas of the present life, karmas of now, and future karma, and so forth. White Tara is very popular. Although she is Tara, in this aspect she helps us develop long-life siddhi. So, I will explain how does it work for practicing long-life mantras and sadhanas. Okay, so when you practice long-life sadhana, such as White Tara, and recite the mantras, it purifies unwholesome karmas of your past life, that you may have unwholesome karma that you’ve created in the past life that makes your life shorter. You may have a number of unwholesome karmas, or maybe one big one, or maybe one little one. You don’t know. We don’t know. But we assume so, because from the reincarnation point of view, that we have no beginning. We do know people have a short lifespan. And we also know, ourselves, that somehow genetically we may not live very long when you look through your experiences about your grandparents and ancestors and they died from a short life. And so forth. And, today is very difficult time, and there are so many causes for shortening life. Disease and all kinds of things, as you know, I don’t need to explain to you. So, this is why we practice long-life Buddhas, so it purify the past life karmas. Meditation and visualization, and especially practices like White Tara, help us work out negative karmas, here symbolized by storm clouds. And also, I’m not only talking about negative karmas of the past life. We have, also, positive karmas. We have virtues and many, many, many lifetimes we have created good karma and virtues and merit. Some of you might think, how do we know that we have created good karma in the past life? Well, we don’t know everything, of course. Human beings don’t know everything, and this is why we call the Buddhas our ‘All-Knowers’ and ‘Omniscient’. So, we don’t know. But when you look at this life, you have a good life, a fairly wholesome life, and especially you have opportunity to practice dharma. You are already practicing dharma. This means that you have created wonderful, good karma in the past life. So then, you may have many, many good karmas and also good karmas of long life. So when you practice long-life sadhanas, such as White Tara and mantras, it brings those karmic seeds that you created in the past life, bringing those karmic seeds, bringing the previous life, long-life karmic seeds out, ripening in this life — to ripen in this life. Because it will be very helpful at this moment, at this life, we have the opportunity to practice dharma. So, why not you make the life longer? In other words, extend your life. It’s like you’re getting extension Visa to extend your life. So, this is why we practice long life, White Tara sadhanas and mantras, and other long-life Buddha practices, such as Amitayus. This is why we do it. White Tara. If you have initiation, in this practice you will visualize yourself arising (generating) as White Tara. If you do not have initiation, usually you visualize Tara in front of you instead of yourself as Tara. Okay, now, how do we do long-life White Tara practice? 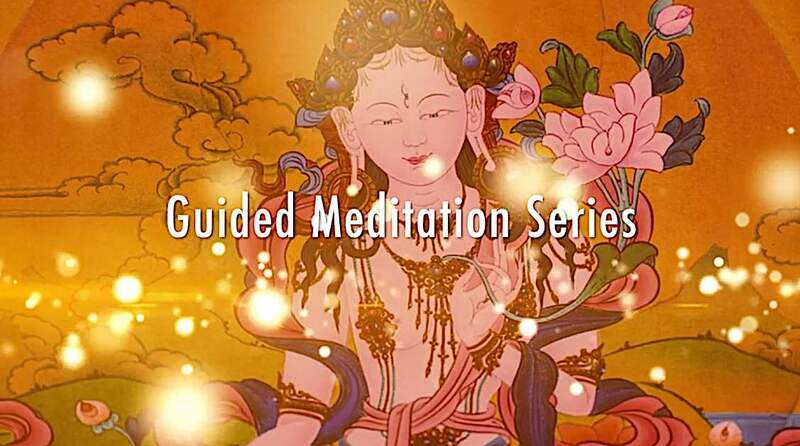 Traditionally, you have to receive the initiation of White Tara from a qualified master, qualified guru. And if you don’t have the initiation, you can also ask mantra transmission to the Lama. And we call Lung, a Tibetan word. Lung means transition, and you can get that from Lama. And if you don’t have the lung, you can still practice and say the mantra, there’s no problem because with good intention, with the devotion, you can say the mantra anytime and any place. OM SVABHAVA SHUDDHA SARVA DHARMA SVABHAVA SHUDDHO HAM. Everything becomes empty in inherent existence, and from the state of emptiness, I arise myself as the White Tara. I generate myself, visualize myself as a venerable, holy White Tara. So, when you say OM SVABHAVA SHUDDHA SARVA DHARMA SVABHAVA SHUDDHO HAM, imagine your ordinary body and ordinary perceptions and ordinary mind dissolve into śūnyatā, emptiness. Visualize a White Tam arising out of emptiness (or oneness). This is the Tibetan Tam. If you can’t visualize this, you can visualize a white TAM in English characters. And from the state of voidness [emptiness], you appear yourself as the White Tara. First you visualize a lotus moon cushion, and then little of the moon cushion you visualize white TAM syllable. T-A-M, TAM syllable, in English. If you don’t know the Tibetan syllable, then you visualize the English syllable, white TAM. And if you know the Tibetan one, syllable, then you visualize Tibetan syllable, TAM. That will be good. And you can also learn, and you can learn the Tibetan letter alphabet. So visualize white TAM syllable, standing on the moondisc. When you visualize the syllable, imagine there are a nature, the syllable is in the nature of light and transparent, and beautiful white TAM syllable. Then, white light shining. White light shining, white light goes out all in directions, ten directions. And especially white light goes to Buddha realms, pure lands of the Buddhas. And this white light bringing the blessings of all the Buddhas. Also, specially, blessings of White Tara in the form of white lights descending. Lots of white lights descending from all directions, dissolve into the white TAM syllable. Tam at the heart of myself as White Tara. If you do not have initiation, usually you visualize Tara in front of you instead of yourself as Tara. After that, the white TAM syllable getting bigger and bigger, and slowly bigger. 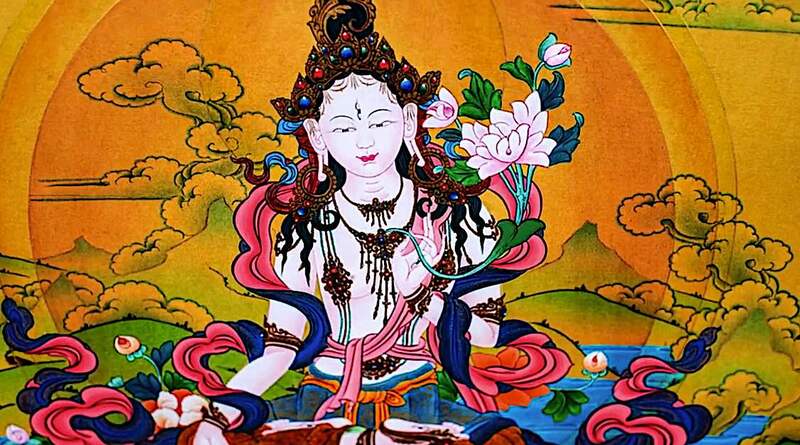 And then slowly merging myself into White Tara. So, I, myself becomes White Tara. And imagine I am sitting on the lotus and moon cushion, I’ve got white color, and white color is color of peace, color of purity. So I have one face, two hands. At this time I am sitting cross-legged Vajra Asana. White Tara sit cross-legged. Different than Green Tara posture. I’m wearing beautiful silk dresses and jewel ornaments, earrings, necklace, and bracelets and so forth. Crown ornaments. I have a ushnisha above my head. I have long hair with top-knot, and the rest of the hair loose and hanging behind my body. I am holding a blue uptala flower in my left hand. And sometimes you visualize lotus flower, so either way is fine. Uptala flower or lotus flower, is an alternative, or optional. So, my left hand is in the mudra of representing Buddhas of the three times; Buddhas of the past, present, and future. 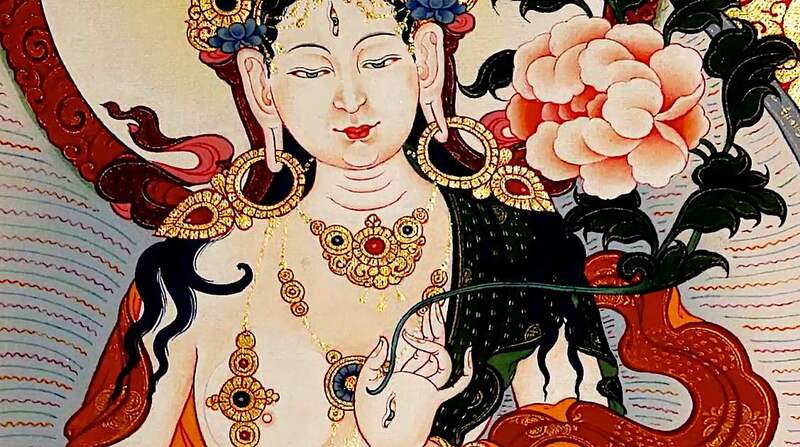 That means I, myself, as White Tara, am the embodiment of the Buddhas of the past, present, and future. Right hand is in the mudra of giving blessing, giving realizations, or helping you to have spiritual realizations. Also, White Tara has seven eyes. One eye on the forehead, wisdom eye, so that makes three eyes, then one eye in each palm of hand, and then also eyes at the bottom of her feet. So altogether, seven eyes. So now, I visualize myself as White Tara. 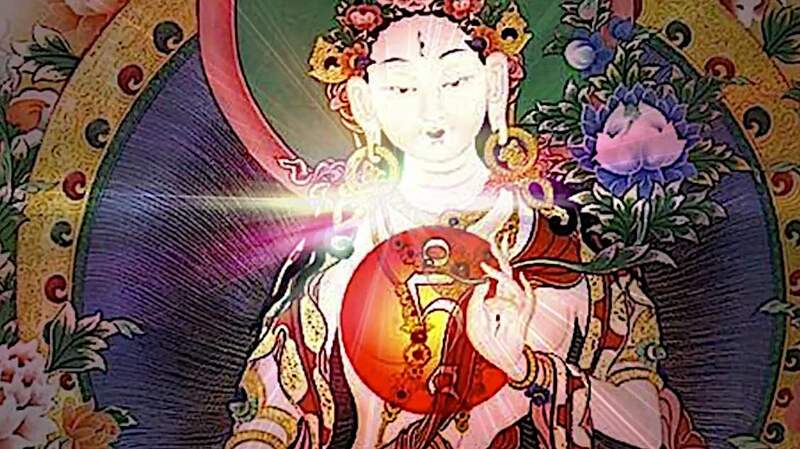 Once you visualize yourself as White Tara, then you visualize moondisc at your heart, horizontal. Then at the top of the moondisc, in the middle of the moondisc, you visualize white TAM syllable, seed syllable. 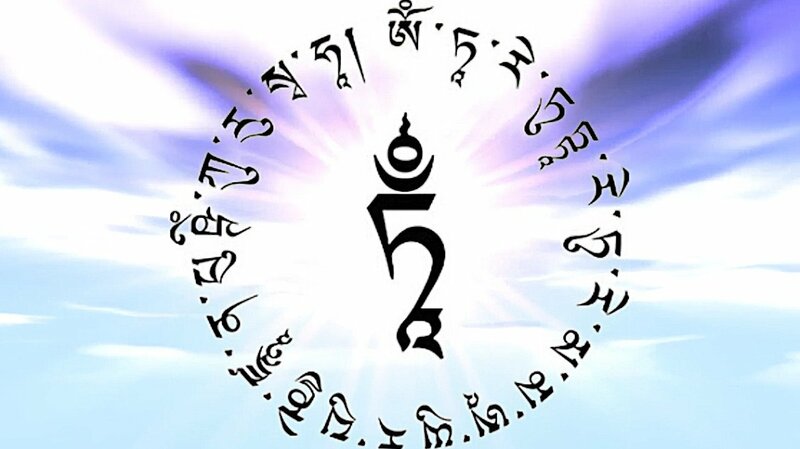 And this time the seed syllable is surrounded by mantra of White Tara. Surrounding the TAM is the White Tara mantra. So, White Tara mantra is different than Green Tara mantra. You visualize Om Tare Tuttare Ture Mama Ayu Punye Jnana Pushtim Kuru Soha. That’s the mantra. So, longer. Extra mantra. You say Mama Ayu Punye Jnana Pushtim Kuru Soha. Om Tare Tuttare Ture Soha mean liberating myself from this world and from suffering and disease and so forth. Om Tare Tuttare is liberating from the cause of suffering; karma and delusions. And Om Tare Tuttare Ture Soha means liberating myself completely from this life, cycle of lives, from Samsara, to reach enlightenment; Om Tare Tuttare Ture. Then you say Mama Ayu Punye Jnana Pushtim Kuru Soha. So that increasing wisdom, virtues. Mama Ayu is increasing long life. Punye is virtues. Jnana is wisdom. Punye Jnana Pushtim Kuru Soha. Punye karma, and good karma and virtues. So, increase your long life, virtues, and wisdom. Punye Jnana Pushtim Kuru Soha. To achieve long life siddhi So, visualize White Tara mantra at your heart, then light shining from your heart. And then you say White Tara mantra, repeat White Tara mantra. White Tara mantra in English with the glowing light body of White Tam. While you’re repeating white Tara mantra, imagine white light shining from your heart, from those syllables. And light goes inside your body through the top of your head to the bottom of your feet. 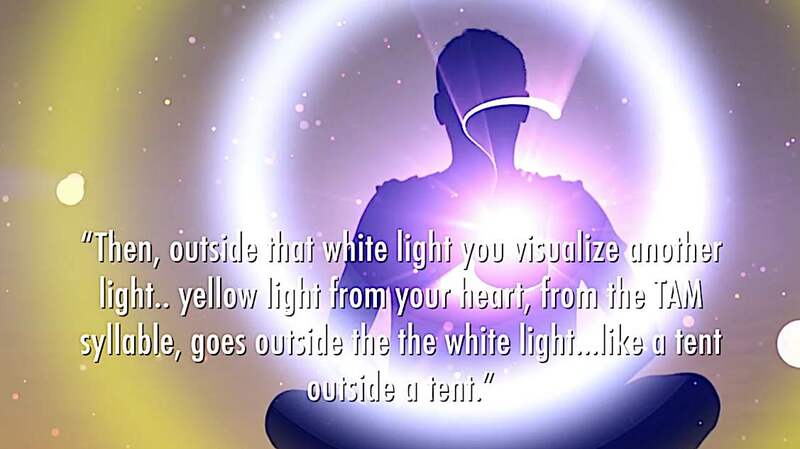 Entire body is filled with white light. Also your mind, your consciousness, is filled with light of longevity and good health. Your senses filled with white light of longevity. Your sense consciousness filled with white light of longevity. Your sense consciousness, primary mind, sixth sense consciousness, they are what we call primary mind. Eye consciousness, ear consciousness, nose consciousness, tongue consciousness, body consciousness, and tactile consciousness, and the main consciousness. All of them, purified. Within this consciousness and the body, if there are any kind of stains, or suffering, or pain, or trauma, or defilement, and subtle disease, subtle defilement, cause of disease, whatever, karmic imprints, all of them are purified. Completely purified. No more. And you achieve long life siddhi. Sanskrit word siddhi means realizations, and powerful realizations. Siddhi. Now, I will explain a little bit more visualization this time. Protection. Protection for your life force. So, we have life. We are alive right now. And because our consciousness is based in your heart chakra, from the tantric Buddhist point of view, the heart chakra. 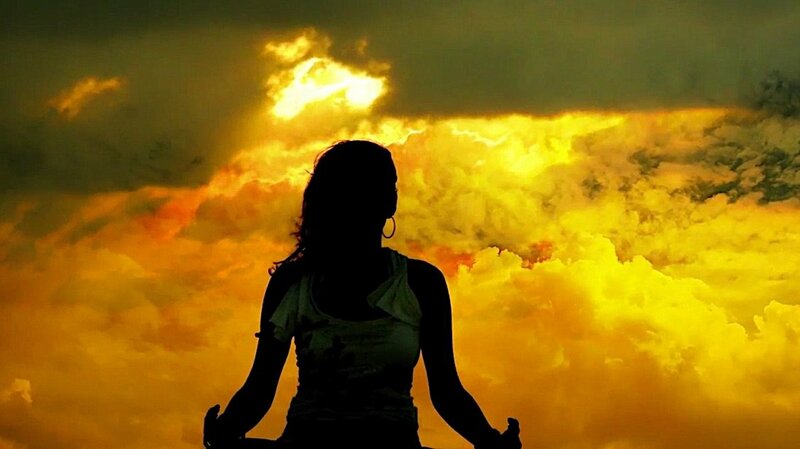 Your consciousness is supported by prana called life-sustaining prana. So, this prana is important prana. It’s very, very, very subtle prana. And this is the most subtlest prana, and it’s called indestructible prana. Life-sustaining prana depends on your karma in this life. So when your karma is exhausting and diminishing, then your life-sustaining prana becomes weak. When the prana of life-sustaining becomes weak, then your consciousness becomes weak. Of course, your body becomes weak, everything becomes weak. Then, gradually, life force is diminishing. Then it makes the life getting shorter, shorter, shrinking, shrinking the life force. This is why people have short life. 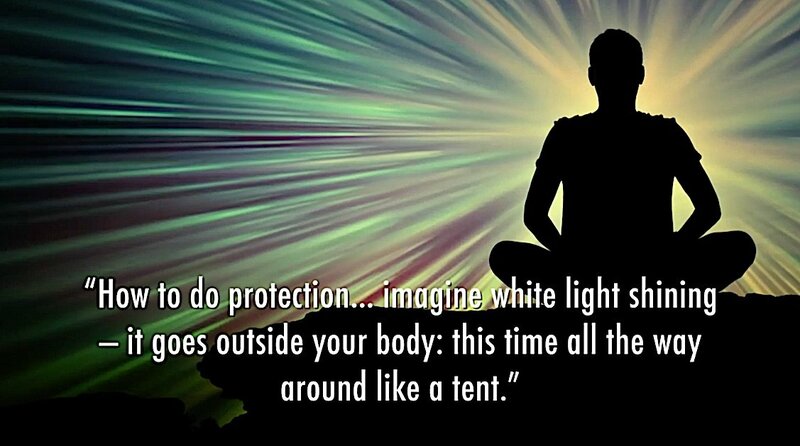 For protection, you visualize white light going out from the TAM at your heart and forming a barrier, a “tent” around you. You imagine no negativity can enter. So, when you do the long-life Tara mantra and breathing meditation, visualization, it purifies unwholesome karmas; it creates virtuous karma. Then your life-sustaining prana becomes stronger, powerful. So it’s like in the oriental philosophy, they talk about chi, inner chi. Same thing. So, your prana becomes stronger and then your consciousness can remain on this life-sustaining prana comfortably and happily. You feel that you want to stay, you are optimistic, and this is how you achieve long life siddhi. Siddhi. And also, you get inspiration in your mind. Positive mind. You get positive imprint. That’s very important. Uplifting, healing. Then you feel, I have purpose, reason to live. I’m not just sitting here waiting, an old man or old lady. I have a purpose to live. So this is why people can live long, and not only live long, but with good health and with good energy. One of my spiritual mentors, he was Mongolian lama, he lived 100 [years] and one month. I’m told the last day of his life, his mind is absolutely sure, clear. And he’d did so much spiritual work, healing, and community service, and rebuilding Buddhism in Mongolia. His name was Guru Dewa Rinpoche. Everybody knows Guru Dewa Rinpoche, and many Tibetan people in India know him very well. So, I believe that he had a long-life siddhi. So, now, I’m going to give you a short explanation on how to do the protection. So then, you focus your meditation at your heart at the white TAM syllable. Now, imagine your white light shining from your heart — it goes outside your body: this time it goes all the way around like a tent. Like a yurt. So, these are white lights, totally, completely solid. 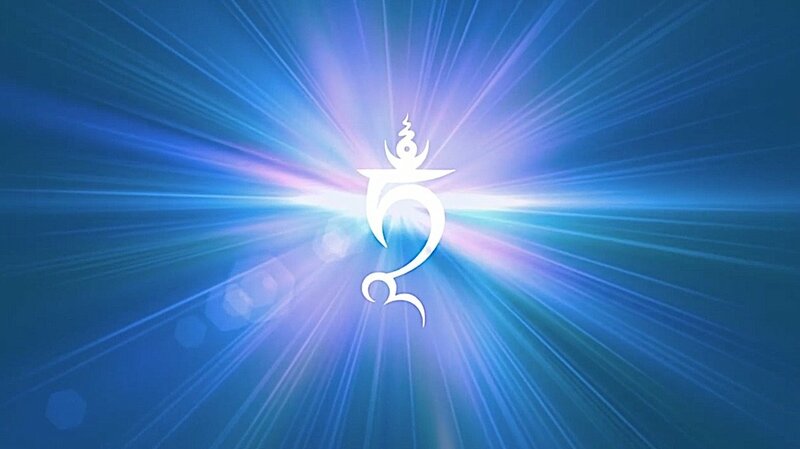 The white light symbolizes peace, siddhi of peace. So then you imagine your body-mind is all protected. And you say Om Tare Tuttare Ture Mama Ayu Punye Jnana Pushtim Kuru Soha. Then, outside that white light you visualize another light. This time, yellow light. Again, yellow light emanating from your heart, from the TAM syllable, goes outside the white light. Another layer of yellow light, like a tent outside a tent. White light is the symbol of peace. Yellow light is a symbol of longevity and prosperity. These lights are very solid. Strong. Nothing can enter, no negative forces. After the initial practice, you visualize protecting your life force with barriers of solid light, first white, then yellow, then red, blue, green. Now, between … Okay, I’ll explain that later. Then, after the yellow light, again, red light shining from your heart, from the TAM syllable, goes out in a layer of red light like a tent. And the red light is a symbol of power. You have long life; power. And then, you visualize blue light. Blue light shines from your heart from the TAM syllable, goes out and outside the red light. Very strong, round, solid, and give you power. Then, last one, you imagine green light shining from the TAM syllable, goes straight outside the blue light. So, the green light is what we call the light of action. So, five colors of light: white, yellow, red, blue, and green. These all symbolize peace, knowledge, prosperity, power, and blue is energy (symbolizes energy and healing), and the green one symbolizes action, activity — like a green color is action and like a green grass, green forest, when spring comes and the leaves are changed, the color becomes green. Like that, action color. So you have five kinds of what we call siddhi, in Sanskrit, peaceful siddhi. Siddhi of knowledge and wisdom, siddhi of power, siddhi of energy, siddhi of action (karma). Sanskrit word is Sita, Ratna, Padma, Vajra, and action [Karma]. White color represents Sita, siddhi of peace. The yellow color symbolizes Ratna siddhi. The red color symbolizes Padma siddhi. The blue color symbolizes Vajra siddhi. And green light symbolizes Karma siddhi. I studied Sanskrit, myself, in Sanskrit University; Sanskrit in India, so I know a little bit about Sanskrit. It is very helpful to know Sanskrit. 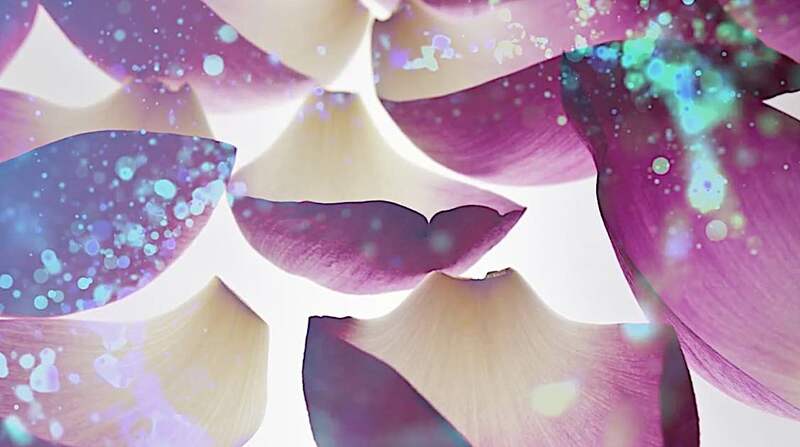 Between the barriers of protective light you can visualize a layer of purple lotus petals. So, you imagine now you have all the siddhis around and you are protected. On top of that, one last thing, between these layers of lights you visualize purple color, lotus petals. Purple color of lotus petals filled between all the layers of colors. 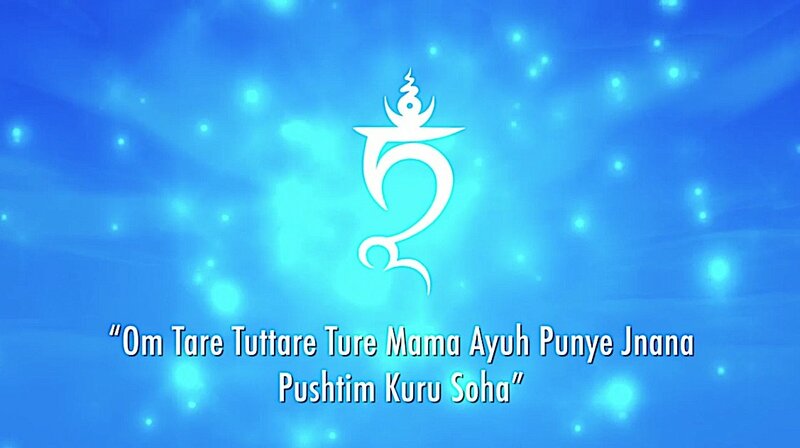 Then you say the mantra Om Tare Tuttare Ture Mama Ayu Punye Jnana Pushtim Kuru Soha. It’s wonderful. Wonderful protection, wonderful for longevity, good health. And I wish you have longevity and much more happiness. Thank you very much. Rebirth Part 2: Is There Scientific Evidence of Rebirth?